Chobe National Park is home to the worlds' largest elephant population, scores of other large herbivores, amazing birdlife, : Read more.. The Serondela area(or Chobe riverfront), situated in the extreme Northeast of the park, has as its main geographical features lush floodplains and dense woodland of mahogany, teak and other hardwoods now largely reduced by heavy elephant pressure. The Chobe, which flows along the Northeast border of the park, is a major watering spot, especially in the dry season (May through October) for large breeding herds of elephants, as well as families of giraffe, sable and cape buffalo. The flood plains are the only place in Botswana where the puku antelope can be seen. Birding is also excellent here. Large numbers of carmine bee eaters are spotted in season. When in flood spoonbills, ibis, various species of stork, duck and other waterfowl flock to the area. This is probably the most visited park section, partly because of its proximity to the Victoria Falls. The newest additions to Chobe are our 46 safari rooms. Individually decorated, they offer every comfort. Each safari room affords our guests the luxury of air-conditioning, luxurious en-suite bath and shower facilities, as well as satellite TV, and telephone. The Safari rooms enjoy expansive lawns which form the banks of the Chobe river. Each room has its own patio that gives one the privacy of enjoying views of the river from the comfort of your own room. The rooms are also in close proximity to the main complex. The north east facing luxurious twin-bed river rooms are air-conditioned and offer the convenience of phone, TV and large en-suite bathrooms. All rooms include two double beds. Our wing of river rooms are attached to the main complex via down stairs corridor or upstairs viewing deck. The river room complex also has it's own riverside garden where guests often take time to photograph the resident monkeys and mongoose. Both our upstairs and downstairs units also enjoy their own private patios. Chobe Safari Lodge is situated in Kasane on the banks of the Chobe River and shares a border with Chobe National Park. Right on our doorstep is the meeting of four African countries: Botswana, Namibia, Zimbabwe and Zambia. Chobe Safari Lodge therefore offers an excellent getaway location to Chobe, Victoria Falls or Caprivi. Our close proximity to Victoria Falls International Airport, Livingstone International Airport and Kasane International Airport makes us easily accessible, with daily road transfers or charter flights connecting all these airports with Chobe Safari Lodge. The lodge has been recently renovated; matching a magical lodge experience to the spectacular game viewing. 46 luxury safari rooms, 22 luxury river rooms, 8 standard rondavels, and camping. Family rooms available. Game drives, boat cruises, fishing, Victoria Falls day trips, cross-border transfers, and more. Restaurant, pool deck, cocktail bar & Sedudu Bar, dinner cruises, WIFI, health & beauty salon. The famous Chobe Safari Lodge campsite offers individual sites scattered amongst the riverine forest close to the Chobe River. Each site has its own power point and is close to one of the modern ablution facilities.The Sedudu Bar overlooks the river and floodplains, and is well known as “the” sundowner spot in the region. One of Chobe Safari Lodges original accommodation types, the traditional thatched rondavels are independently positioned, with air-conditioner and en-suite bathrooms. These detached units are positioned close to the river in the lodge gardens. The rondavels are positioned to the west of the main complex and are also a very short walk to the main complex. Vic Falls & world's famous elephant park. 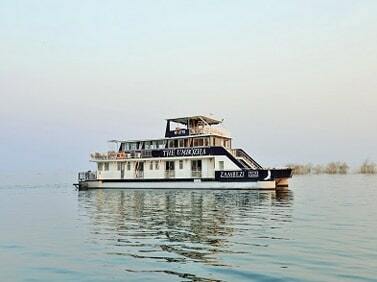 Lake Kariba Houseboat Safaris are a fantastic way to experience .Read more..